I found this meme in an article posted at the blog hosting site Worldpress. The blog is called "Why evolution is true”. Its simplicity caught my eye. 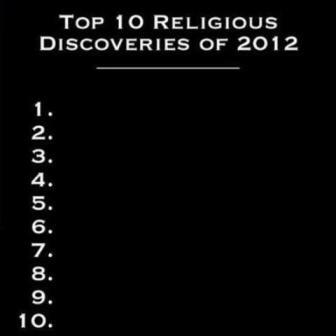 It presents an empty list of “Religious Discoveries” (Whatever that means). In the article this meme is contrasted with a list published by the Wired Science web site: “10 Top Scientific Discoveries and Accomplishments of the year 2012"
The implication in the article is obvious: religion lacks the progressiveness of science. Science is always advancing by quantifiable, concrete discoveries. Science contributes to the progress of humanity where religion is devoid of anything useful. This is a common theme of the new atheism: Pining the usefulness of science against religion apparent sterility. I find articles like this one disturbing, not because they present a serious threat to religion, but because they reveal a disturbing worldview. To see what I'm talking about one just needs to take a closer look at the list of scientific discoveries from Wired Science. Of the "10 Top Scientific Discoveries" 2 are from quantum physics, 3 are from astronomy, 2 are from genetics, 1 is from material sciences, and the last 2 (9 and 10) are not discoveries at all but milestones of exploration and government policy. These last two could hardly be called science, and I suspect they were added just to make the list an even 10. This seemingly innocuous fact will become significant later. Looking at the list of scientific disciplines it is obvious that for the author only a certain type of disciplines produce any discovery worth reporting. Physics, astronomy, genetics and material sciences are part of what is known as natural or “hard” sciences. These are disciplines which rely on quantifiable data, and mathematical models to generate understanding of natural processes. There is, however, another type of scientific disciplines which cannot be placed in this group because they do not rely in repeatable mathematical process but on observation, inference, conjecture and qualitative analysis of data. Examples of these are anthropology, sociology, paleontology and archeology. These disciplines are also known as soft sciences. Apparently for Wired Science, soft sciences did not produce any significant discoveries last year; at least significant enough to make the Top 10 List. You might be thinking "well in a 10 items list it is impossible to report everything!" but we need to remember one important fact: items 9 and 10. The reality is that these can hardly be called discoveries. To be more blunt: Are we to believe that last year, the government, changing its policy on chimpanzee research, is more significant than all the research performed by archeology, sociology, paleontology, psychology and the rest of the soft sciences? This is the crux of the matter. For the person compiling the Wired Science list and for the atheists using it to score cheap points against religion, the only science with any significant value is the type of science which only advances our knowledge of the physical world. Science which is quantifiable and can produce repeatable data. Disciplines such as sociology, anthropology, paleontology or archeology are not worth the ink in which their scientific papers are written. You might be asking why this worldview is dangerous; what is the big deal? Well, soft sciences, when applied to the human race, provide a view of who we are as a species, where we come from, what motivates us, what gives meaning to our existence; the things which make us unique among all the other species in this planet. Denying the validity of these disciplines makes scientific advances to be guided exclusively by utilitarian goals. Science becomes the search of just the things can be replicated, reproduced and exploited. This worldview deprives science of its humanity; and when we allow this, science, to paraphrase the great Mahatma Gandhi becomes evil. The new atheists would like very much to convince us that religion has nothing to offer to the human race. The problem is that it does not matter how much they wish for it to be gone, religion IS part of the human experience; it is intertwined with everything the human person does; it is part of our collective culture and art. It follows then, that any contributions of religion to the human race will occur in the fields of science which study the human person and its development. It is in these areas of scientific study that we will find the contribution religion has offered to mankind. There is one last thing about the “Why Evolution is True” article. In their zeal to take jabs at religion and pin it against what they consider the only valid type of Science the writers of this article place themselves in an embarrassing position. Perhaps you already noticed: The soft sciences of anthropology, paleontology, sociology, etc. are the same disciplines which have provided most of the evidence for the Theory of Evolution. The same theory they named their site after! The irony is exquisite; they have to go to that which they disdain the most to justify their own name. Here is some homework for you. Go to Discovery's "Top 10 Archeological Finds of the 21st Century", Take a look and tell me how many of these are religious in nature. Extra credit if you can see any references to Christianity. Enjoy!